An idealized female body can be found in much of Caitlin Keogh’s paintings, though often missing a head or relegated to disembodied arms and hands. Keogh’s women present beauty while remaining anonymous, captured in the artist’s recognizable sharp outlines and flat colors. 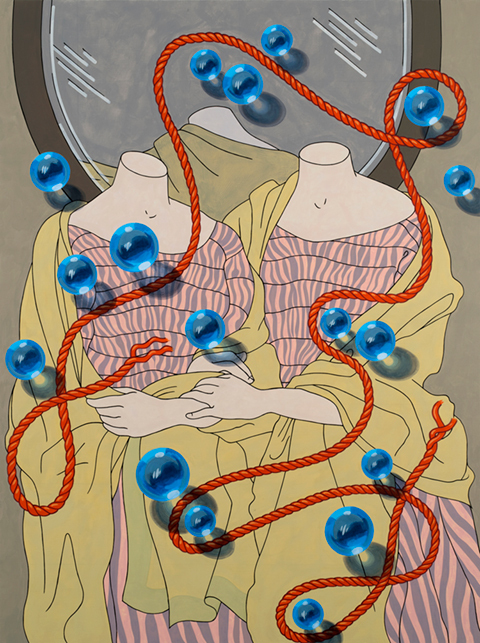 Illusionistic elements — like the transparent blue spheres seen here — interrupt her illustration-inspired compositions, and allude to Surrealism’s profound influence on the artist. Born in Alaska and currently living in New York, Keogh’s first solo museum exhibition was recently on view at the ICA Boston this summer.